Cara C. Putman joins us today to talk about her latest book, Shadowed by Grace. Cara, Shadowed by Grace involves a unique group of soldiers dedicated to saving art and architecture during WWII. What got you interested in the Monuments Men? It was one of those God moments. I have deep respect and admiration for the men and women of the Greatest Generation, and I love telling their stories. Because of that, I’m always on the lookout for new ideas that will spark into a book. In the summer of 2010, I stumbled across a nonfiction book, Monuments Men, and was introduced to this small band of soldiers. Their stories captured me…and the art added a unique twist to the story. It became a story that burned in my heart to tell. Shadowed by Grace focuses on some of the endeavors the Monuments Men undertook in Italy. I knew little of the Italian front and discovered a diary that gave voice to the Italian experience. That added with what I was learning about the efforts of the Monuments Men to save priceless monuments and paintings convinced me this was a story I wanted to write. Then I discovered the heroine and her search, and it became part of me. I love this story and am thrilled by the early reactions I’m hearing. Are you an art buff or was that something you had to become more knowledgeable in to write the story? I wasn’t an art buff until two things happened. 2) I took art history in college because I knew I would fail music appreciation. Even then I knew myself well enough to know I was a visual learner rather than audio. So when I discovered the Monuments Men it tied into the appreciation I already had for the great masters whose works were scattered all over Europe. Add in the grand buildings and cathedrals, and I could see how important it was to make an effort to preserve them in the first war of widespread aerial bombardment. Introduce us briefly to the main characters in Shadowed by Grace. Rachel Justice is a photojournalist on her way to Italy to cover the war. But she’s really there to search for the father she never knew. She’s surprised that her journey includes a search for love and a search for her heavenly Father. Scott Lindstrom is a museum curator assigned to the Monuments Men. He’s one of the elite group of men assigned the task of saving western civilization. In Italy the army didn’t know what to do with the Monuments Men, so his job was compounded and made even more difficult. Part of what makes this story so unique is the fact that the heroine is a photojournalist. Not only was photojournalism a new discipline at the time, but few women were allowed to see the front lines. What kind of challenges did that pose for you while writing the book? I wanted to create a unique job that a woman could have on or near the front lines. If she could be an artist in her own right, all the better. That made war photojournalist the perfect role for Rachel. I found it fascinating to research the women who filled those jobs. Everything from their dress to how they worked in the field had to be explored. Once I found a couple key books, it made it easier. But I didn’t know much about war correspondents until I started writing this book. It’s a good thing I love history and getting the details right. Stars in the Night would tie with Shadowed by Grace. Stars in the Night was the first time I got to tell a fuller WWII story and it incorporate the glitz and glamour of classic Hollywood with a unique piece of WWII homefront history and a body count. Shadowed by Grace contains a piece of WWII history with the Monuments Men that fascinated me and it’s the first time I got to tell an international story, which has its own set of challenges. What made you decide to start creating characters and story world? I’ve always had a love for good books and stories. When I was a teen, my favorite authors didn’t write new books fast enough – now I understand why! But at the time I thought they should be able to write more books in a year, so I decided to try my hand at it. Life intervened after I’d started two books, but the desire to write never died. In God’s perfect timing, He resurrected the dream and gave me the green light to chase the dream again. My next project is a Christmas WWII novella collection with Tricia Goyer and Sarah Sundin entitled Treetops Glisten. I love Tricia and Sarah and their WWII novels, so it was a joy to work with them on this collection. We got on the phone and started brainstorming a collection of stories that would fit with the type of WWII novels we each write. “Should be near a big city but have a small town feel.” “Probably located in the Midwest.” “Needs war industry and a university.” I started laughing as I listened, because they were describing Lafayette, Indiana, where I live. It was fun to work in collaboration on everything from where they would live, to family timelines, to sibling order, etc. Writing is so often solitary, but writing this collection allowed us to step outside of that. Sarah came out in September to do some on-site research. Tricia will be here in February, so it will be fun to take her to the candy shop my heroine works at, drive her by the Turner home, and more. Cara C. Putman graduated high school at 16, college at 20, and completed her law degree at 27. An award-winning author of seventeen books with more on the way, she is active in women’s ministry at her church and is a lecturer on business and employment law to graduate students at Purdue University’s Krannert School of Management. 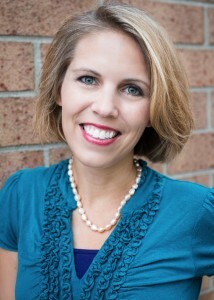 Putman also practices law and is a second-generation homeschooling mom. Putman is currently pursuing her Master’s in Business Administration at Krannert. She serves on the executive board of American Christian Fiction Writers (ACFW), an organization she has served in various roles since 2007. She lives with her husband and four children in Indiana. You can connect with her online at: her website, Facebook, Twitter,Pinterest, and Goodreads. 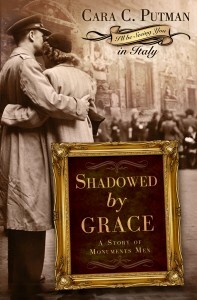 You can purchase Shadowed by Grace, at Christianbook.com, Barnes & Noble, Amazon, Lifeway, and anywhere else books are sold. Rachel Justice is desperate to save her dying mother. She doesn’t want to leave her, but she accepts her newspaper’s assignment to travel to Italy and photograph war images. No one knows her photography is a cover and that Rachel is really seeking to find the father she never knew, hopeful to get some help with her failing mother. Dedicated to her mission, Rachel is focused on completing it. Soon, though, she finds her priorities and plans changing when she is assigned to Lt. Scott Lindstrom, on mission as a Monument Man. Their meeting will have far-reaching consequences. Will this derail her plans? Will she ever find her father? Is her faith enough to carry her through? Love’s Sweet Beginning – by Ann Shorey SWEEPSTAKES!